Walking through the city, doing stuff and seeing things makes people hungry. I’m no exception. Luckily there is Boguette in the center of the city, just a few meters away from the Markthal. It is my prime spot to recuperate and refill my stomach so I can explore the city once more. 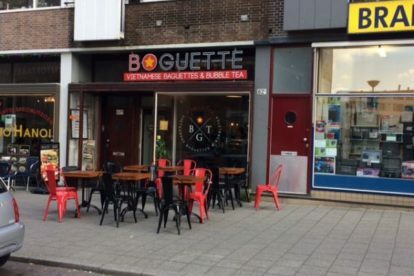 Boguette is known for selling two things: bubble tea and their Vietnamese Baguettes also known as Bánh Mì. Bubble tea is a drink with a base of black or green tea. You have the choice between a milky bubble tea or a fruity bubble tea and on top of that you can add your own topping as you see fit. Bánh Mì is a Vietnamese Baguette typically found on every street corner in Vietnam. Fortunately for us, Boguette brings the Bánh Mì to Rotterdam. Bánh Mì is a freshly baked baguette filled with marinated chicken or pork, special mayonnaise, fresh vegetables, cucumber and (if you like) some coriander and chilly peppers. For me, it is the perfect midday snack when I’m hungry (and therefore grumpy)! The staff is very friendly and they are happy to help you put together your perfect tea and baguette!